I was aware that depreciation on the new high tech equipment was much more tan for traditional capital equipment and a major reason that net capital formation was much weaker now than historically. But I did not think depreciation was as large as you have here. 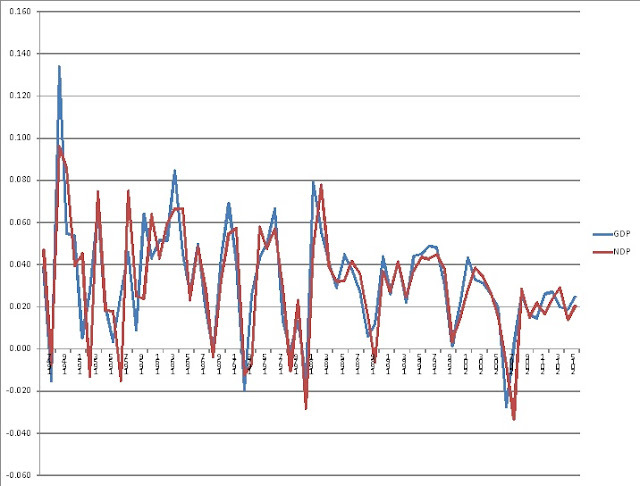 Decoupling the stock from the flow is a weird trick. 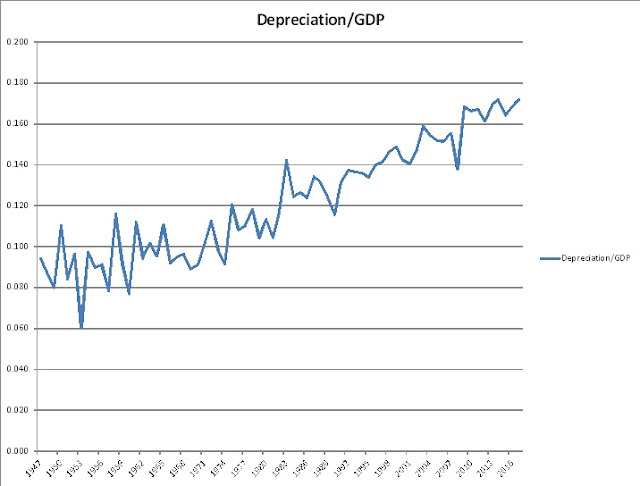 There are many issues with using "GDP"... GDP as originally and properly defined was a vector of physical quantities. 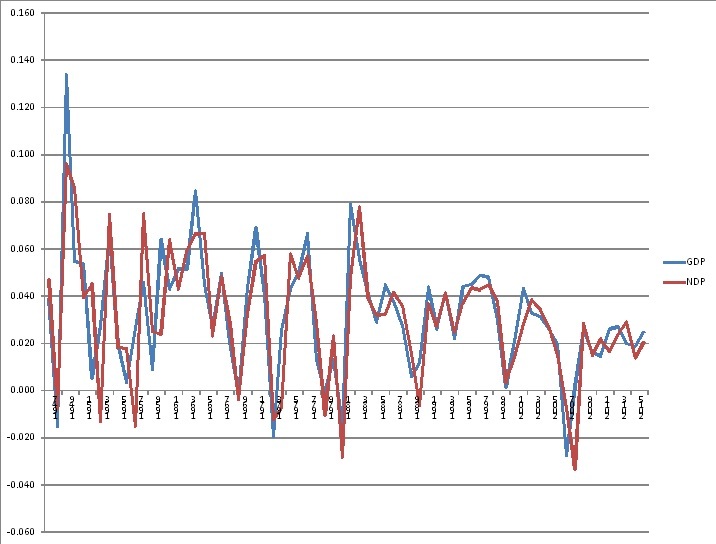 Instead both nominal GDP and "real" GDP are indices computed from that vector and a vector of prices, plus in the USA a vector of "hedonic" adjustments. However even in the actual GDP as vector of physical quantities there is a lot of double counting; for example most of education or research is not final output, because most of it is done to increase production, so either it does increase production, and then it is an intermediate cost, or it does not, and then it cannot be added to GDP regardless. Another problem is that often people talk GDP, but actually mean GDI, and a large part of GDI arises from rentierism rather than production, something that causes complications in reconciling GDP to GDI. Dear E.K-H, unfortunately I very strongly disagree that studies of the political economy can be a "science" as in proper accuracy and falsification, in large part because experiments are difficult and repeatability is pretty rare, and never mind with the measurement problems, because the "Laws of Economics" are not immutable, unless they are kept in “the swamp of vagueness and inconclusiveness”. Rather than calling it a "social science", which to me seems "scientism", I call studies of the political economy a "discipline", that is a systematic, but somewhat fuzzy and time-dependent, analysis and summary. I reckon that even in the best cases concepts like GDP (or "capital" or "profits") have only imprecise boundaries, in particular but not only because they are aggregates of incommensurables; they make mostly suggestive sense, as long as we realize it. That unfortunately means that your approach that relies on abstractions like “income, monetary profit, aggregate demand, GDP” seems overambitious to me. Not being an economist, your rants glide off me with indifference, Egmont. I am actually a literary critic by methodology. One who studies the discourse of economics, as discourse, and who is troubled by the consequences of evident pathology in that discourse. I would be inclined to agree that economics as practiced is not science but would further agree with blissex view that economics can't be "scientific" in any rigorous way. The proliferation of superfluous mathiness is clear evidence of chronic anxieties about not being a science and an attempt to mask the unscientific premises and assumptions with a language that the layperson associates with science. Sadly, Egmont, your incessant carping about "science" strikes me as the same sort of hyperventilated disavowal. "...with all their peer-reviewed articles/textbooks/blogposts have finally to be flushed down the scientific toilet." O.K. Kakarat, your comments getting flushed. I only tolerate as long as you behave yourself.